The “Friends” do sterling work, fundraising for the upkeep of our historic Norman church building. If you would like to join “The Friends of St Edmund’s” please download the membership form and follow the instructions. Grateful thanks to all who helped to make this year’s event successful. The Open Weekend 2019 is already being considered. St Edmund’s Church is an absolute gem to visit for anyone with an interest in family and local history, #churchbuildings and architecture, and the more general history of our country. Come in and view the extensive display of items and pieces from our parish archives, taking you on a journey through time. 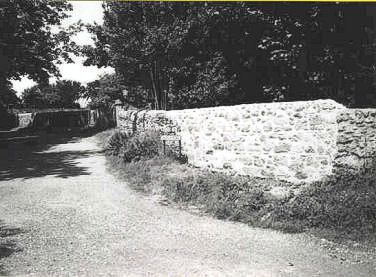 You may even get to chat with the Parish Archivist who is a fount of knowledge on the history of the church in Wootton. Why not ask about joining the “Friends of St Edmund’s”? 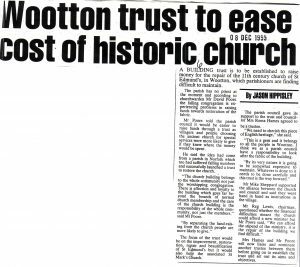 Due to changes within the Church of England there was in the mid 1990s, a threat to close some churches. 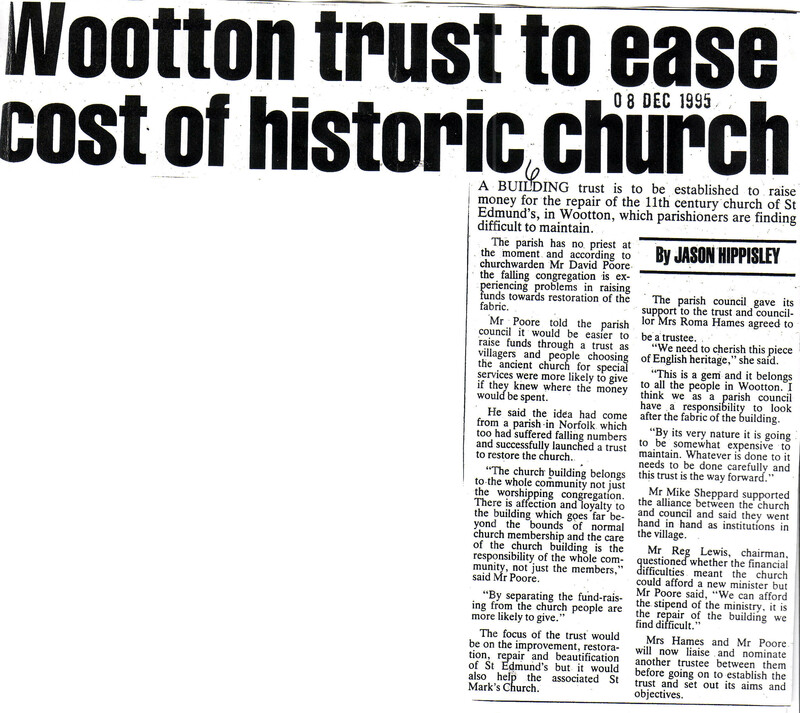 Wootton , having two buildings serving the same Parish was vulnerable. St. Edmund’s Church building could not be expanded, so that the sister church of St. Mark’s would become the main worship centre, and St. Edmund’s would be made redundant and closed. Because of this possibility, the Archdeacon of the time, the Revd. Tony Turner suggested that we set up the St Edmund’s Church Building Trust , a charitable Trust to help maintain the building and keep this valuable spiritual and historical heritage for the village. 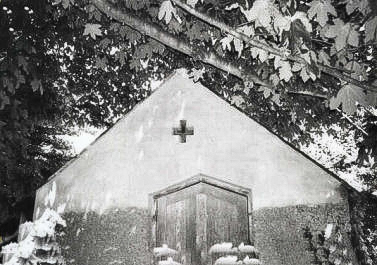 In the event of the church being declared redundant under the Pastoral measures Act the Trust would have legal rights regarding the use of the building. The Trust was launched at our first Annual Open Weekend, August Bank Holiday 1996. A Friends section was initiated whereby members of the public could join and produce support and funding for the Trust, with a Management Committee as controlling agents. The Trust Deed was produced in July 1997 with the legal expertise of Tony Turner and Peter Smith. David Poore became the Founder Trustee with Parish Councillors, Mrs Maureen Stolworthy and Mrs Roma Hames as co Trustees. During the years since then the Trust has been able to fund over £46, 000 worth of repairs and renovation. Most of the funds have been raised through the generosity of our members and sympathisers. repair and rehanging of the bell. Construction of a new vestry staircase to the organ loft. 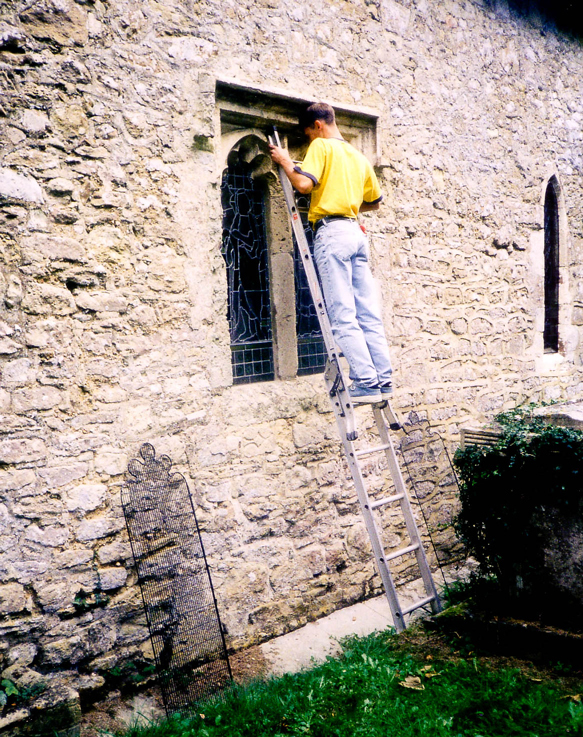 repair of two of the set of four lancet windows in the chancel. The leading had decayed and the glass was bowing , creating holes through which the wind blew, often down the necks of worshippers. The other pair were last repaired in the 1970 s following a spate of vandalism. Repair and reconstruction of two buttresses.